“Just One Love” written by Kimmie Rhodes – recorded at Sun Studios with Joe Ely January 1989. Jack Cowboy Clement plays dobro and Joe Gracey plays rhythm guitar. 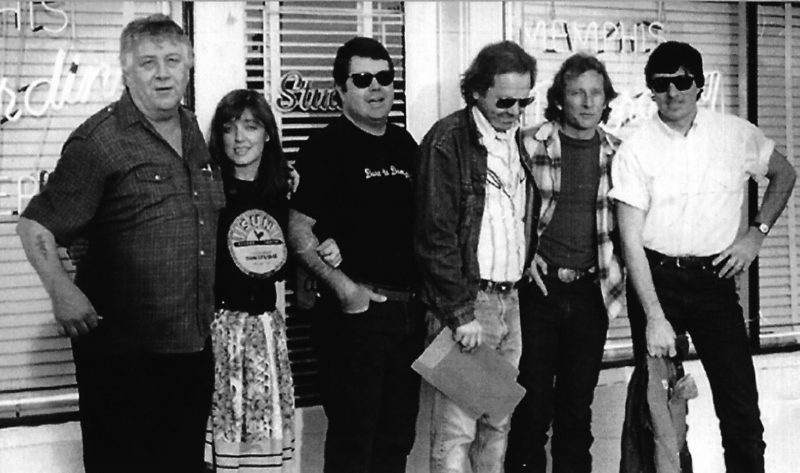 Recording at Sun Studios in Memphis with Cowboy Jack in 1989 (l-r) Kimmie Rhodes, Joe Gracey, Johnny X Reed, Joey Miskelin and Jack Clement. 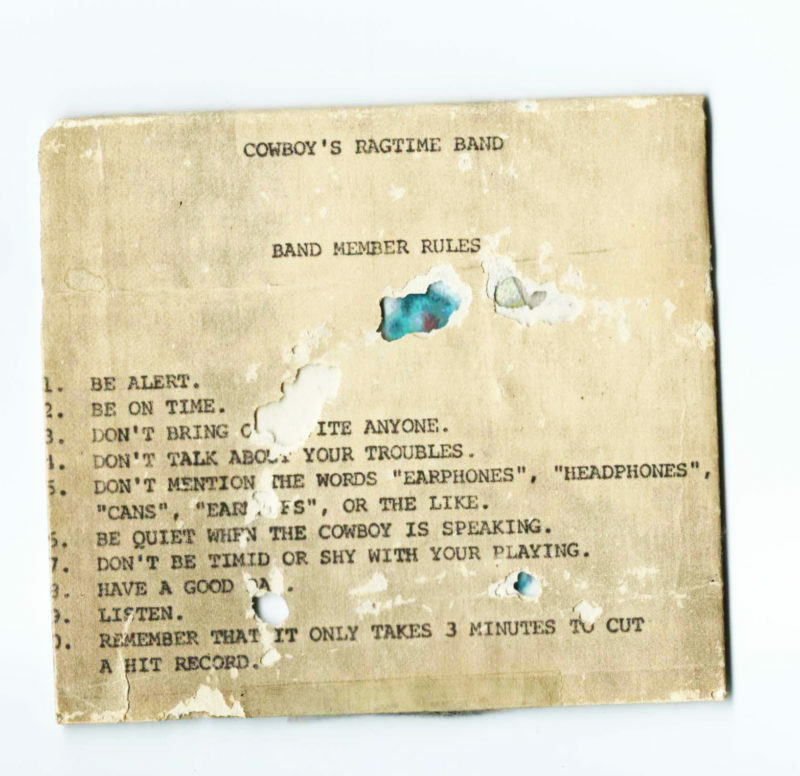 The copy of the famous “Cowboy’s Ragtime Band Rules” that hung on the wall at Sunbird Studios in Austin, Texas. Once we were back in Texas, we talked to the owners of the label I was with, Heartland Records, who were house. To their credit, it didn’t take much hustling to convince them to fund a recording session at Sun. In fact, they liked the idea so much that they started begging me not to change my mind! 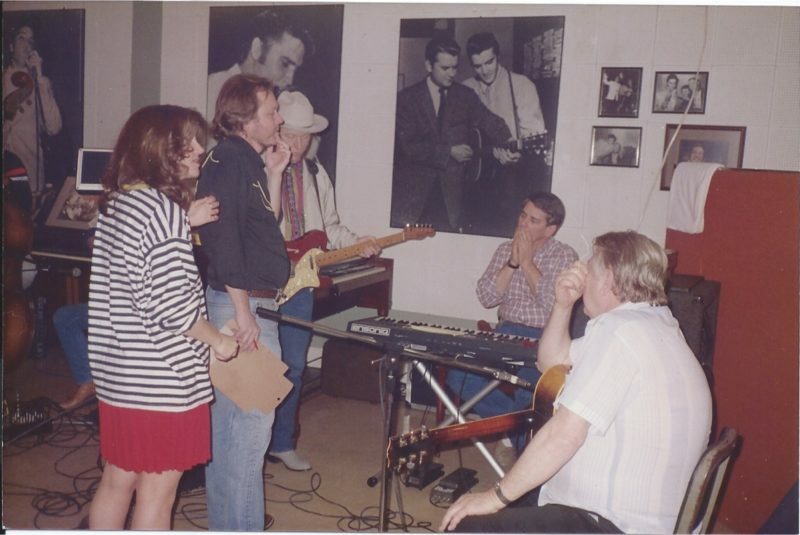 I finally got the courage (and money) to quit the last “real job” I ever had, working at a folk art gallery, and we were back at Sun Studios within three weeks with a band assembled, partly from Texas and partly from Memphis and Nashville, to record all the new songs I’d been writing. David “Fergie” Ferguson came along to fill Cowboy’s shoes from the olden days, as engineer, which made Cowboy free to play rhythm guitar and sing along. Believe me, with “The Cow” in the room, the bar was definitely raised. Johnny X Reed, guitarist for the Jackalopes, was there, as was Wes McGhee (guitar), Dale Dennis (bass), and Joey Miskulin, who was Cowboy’s current resident genius and played keyboards and accordion. We arrived the night before the sessions and set up the studio so we would be ready to go the next morning. Then we all sat out on the back steps as the sun was going down. It was one of those extraordinary “golden hour” evenings. Because he knew how excited we were to be there, Cowboy started strolling down memory lane, telling stories, and we soaked it up. He was really sweet to entertain us in that way and add to the experience. Besides, anyone who ever knew him can attest to the fact that Cowboy loved to hold court. He said that back in the old days, when directions were given to get to the studio, they’d say, “Just look for the tiny building with all the Cadillacs parked out front.” Then he pointed to a long building next door that ran far past the studio to the end of the big parking lot and said, “There’s why Sun didn’t make it. That’s where they kept all the returns.” There are two things that can kill indie labels. One is getting the returns of records that didn’t sell, and the other is not being paid by the distributor. Sometimes they get this thing going where they collect the money from your sales but use it to pay people they owe farther back in the pipeline, figuring they’ll catch up. But if they can’t keep up with that game, they eventually go under and take a lot of small labels with them. I had a song to record with Joe Ely as a duet, “Just One Love,” that I had literally written on the way to his house to play it for him before I left for Memphis. It’s crazy, looking back now, to think that I would decide to write the song on the way to his house, which was only about forty-five minutes away! Once we were in Memphis, at Sun Studios, Joe flew in from Austin to record it with me. After we had cut the first take, we were all standing around in the tiny control room listening back and trying to decide if it was “the one” or not. This went on for a while, and I finally said, “Well if it’s ‘the one,’ why are we all standing around trying to figure out if it is or not?” Cowboy’s head jerked in my direction, and he grinned and said, “She’s right. Let’s go do another one.” We went back into the studio and did another take, and when we came back in to listen, Cowboy grabbed me and started dancing all over the tiny room! (He had, after all, been an Arthur Murray dance instructor and even still carried his business card from those days and enjoyed whipping it out and showing it to people from time to time.) It was truly joyous. Ironically, not long after that, I was in Nashville at the office of some record executive who had just rejected me as a viable artist. He made the remark that “If Jack Clement danced to your song, legend had it that you had a hit.” I didn’t even bother to tell him. I figured he wouldn’t believe me anyway.